Screening Screen Time: How to manage tablets, phones and TV time. What new research says about children and screen time and how to apply it at home. Do a Google search for kids and screen time, and you will find headlines that say everything from “screens are toxic for kids” to “kids can watch Winnie the Pooh all day if they want to.” Most recently, a new study claims there is no evidence screen time is bad for kids. But what does that tell us when combined with other things we know? We looked at the latest research, as well as recommendations from the American Academy for Pediatrics, and this is what we found. The first long-term study on how screen time affects children’s brains suggests it could do damage. The study is called Adolescent Brain Cognitive Development (ABCD), and it is the largest long-term study of brain development and child health in the United States. Through ABCD, researchers are tracking the development of 11,874 children through adolescence into young adulthood. At this point, the kids participating in this study are nine to ten years old, and the study is still ongoing. Does screen addiction change the brain? Yes, but so does every other activity that children engage in: sleep, homework, playing soccer, arguing, growing up in poverty, reading, vaping behind the school. The adolescent brain continually changes, or “rewires” itself, in response to daily experience, and that adaptation continues into the early to mid 20s. Several articles have popped up recently, citing a new assessment made by a group of pediatricians in the UK. The doctors say there’s not enough evidence to limit screen time. While none of the recent studies have been able to show solid evidence that screen time has negative effect on children, the group of scientists did suggest another connection between screens and negative outcomes. The Royal College of Paediatrics and Child Health in the UK says that screen time could have a negative effect on young brains by taking up the time that could have been spent doing other valuable things. Talking or socializing, being physically active or sleeping, for example. Another recent study says that rewarding children with screen time leads to more screen time. The University of Guelph in Ontario, Canada found that children whose parents give screen time as a reward or take it away as punishment, spend more time with screens. In an article for Science Daily, the researchers highlighted that these findings are a lot like studies that show the same results for parents who use candy as a reward. “When you give food as a reward it makes children like the carrot less and the cake more. Same thing with screen time.” — Jess Haines, family relations and applied nutrition professor at University of Guleph. The same study also found that parents can set the example for children’s screen habits. Time parents spent using screens in front of their children is related to the screen use of kids. However, this was only observed among mothers in the study. The researchers think this might be because mothers spend more time with their kids. How early childhood experts can help parents find a media plan that works for them. Make your own family media use plan. Media should work for you and within your family values and parenting style. Make your plan at HealthyChildren.org/MediaUsePlan. Treat media as you would any other environment in your child’s life. The same parenting guidelines apply in both real and virtual environments. Media use, like all other activities, should have reasonable limits. Unstructured and offline play stimulates creativity. Make unplugged playtime a daily priority, especially for very young children. Screen time shouldn’t always be alone time. Co-view, co-play and co-engage with your children when they are using screens. Because children are great mimics, limit your own media use. Know the value of face-to-face communication. Very young children learn best through two-way communication. Engaging in back-and-forth “talk time” is critical for language development. Limit digital media for your youngest family members. 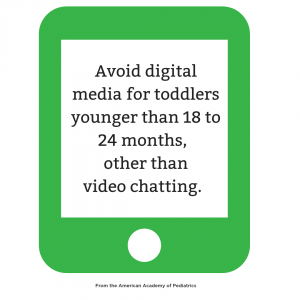 Avoid digital media for toddlers younger than 18 to 24 months other than video chatting. 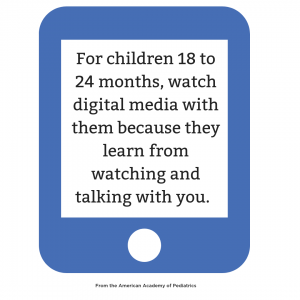 For children 18 to 24 months, watch digital media with them because they learn from watching and talking with you. 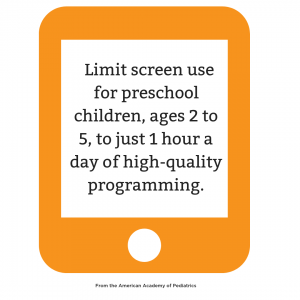 Limit screen use for preschool children, ages 2 to 5, to just 1 hour a day of high-quality programming. Keep family mealtimes, other family and social gatherings, and children’s bedrooms screen free. Don’t use technology as an emotional pacifier. Media can be very effective in keeping kids calm and quiet, but it should not be the only way they learn to calm down. Apps for kids – do your homework. More than 80,000 apps are labeled as educational, but little research has demonstrated their actual quality. Products pitched as “interactive” should require more than “pushing and swiping.” Look to organizations like Common Sense Media (www.commonsensemedia.org) for reviews about age-appropriate apps, games and programs to guide you in making the best choices for your children. 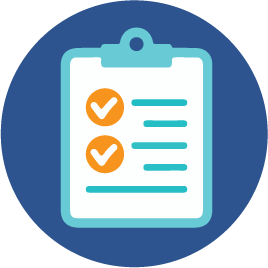 Read an extended version of the American Academy of Pediatrics’s tips for children and media here. Managing screen time is important. And although discussing and making media plans are all great ideas, perhaps another approach is to do more of the things you already know are good for little ones. Children show the most brain development when they spend lots of time playing. Playing is how children learn. The more time they spend exploring their environment and using their imagination to solve problems, the more children will understand about how the world around them works. Developing fine and gross motor skills can develop other areas of the brain, like language. Research shows that play and learning is not just for learning how things work. When young children develop the parts of their brain that are related to motor skills, the parts of their brain related to language develop too. Talking to children helps them build trust and identify their feelings. By exploring your little learner’s reactions together, you teach them that they can trust the connections they are making in their minds. When a child feels secure in their learning, they can explore and build upon that knowledge. Children who don’t feel secure about what they are learning are less likely to build from one idea or feeling to the next. Read more about serve and return. Babies — Ask him where his ear is and watch him demonstrate how much he knows! One-year-olds — When it’s bath time, give your toddler some different-sized plastic containers. Then, watch her work her magic. Two-year-olds — Soft. Hard. Cold. Hot. Messy. Fast. These are just a few of the words your toddler might use to describe how things look, feel and react. Three-year-olds — He may pretend to “run away from his shadow” or hand you “hot rocks” from a sunlit pathway. Pre-K learners — Why is a noodle stiff at first, then floppy later? The little scientist in your house is asking new questions about the world around him.